The i–Puppets stalking the streets. FOR ALL the shows taking place in theatres, venues, bars, and even the Big Top, if no events and happenings are taking place on the streets of the city during the arts festival, then it just isn't the arts festival. Street events are a key part of what makes the Galway International Arts Festival work, and what accounts for part of its enduring popularity. These are events which take place among the people, where the public can interact with the performers, 'experience them up close and personal'. This is art for the people and this year's festival will see Galwegians getting really involved, by creating one of the events themselves. The People Build will see the public invited to take part in a spectacular architectural event devised by the French artist Olivier Grossetete. Over four days in Eyre Square, thousands of cardboard boxes will be transformed into the building blocks of a democratically assembled building, created through human power and collective endeavour. Once the structure is completed, Galwegians will join forces in a massive celebratory demolition. Construction dates are July 22 (11am to 4pm ); demolition is July 23 at 4pm. There will be free workshops from July 18 to 21. Big Brother is not an all-powerful computer keeping tabs on you. It is actually four tall and skinny beings with giant eyeballs for heads! These are the i–Puppets, they come from another time and place (Dutch company Close–Act’ to be precise ), in search of something...could that something be you? They will be stalking the region between St Nicholas' and the Big Top, Fisheries Field, on July 28 and 29, at 6pm and 11pm. French masters of street spectacle Transe Express, who brought us the Giant Divas in 2015, return to Galway with Chariot Of The Sea and Mobile Homme. A high–energy interactive street show, Chariot Of The Sea will be a maelstrom of percussion, atmosphere, and colour, as its weaves its way from Eyre Square to the Spanish Arch (July 21, 10pm ). Mobile Homme will see a parade of drummers and percussionists meander between the Spanish Arch and Eyre Square (July 22, 4pm ). 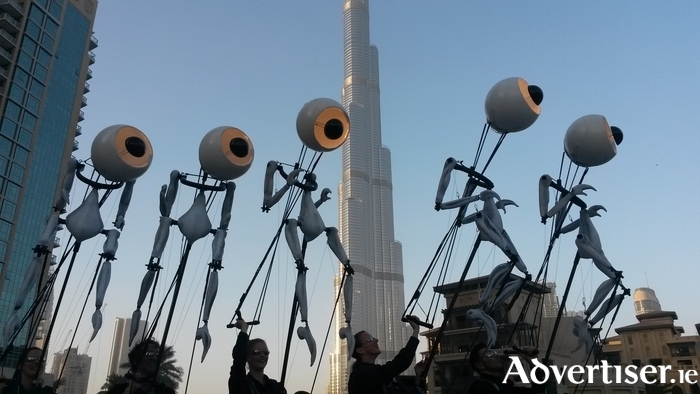 Joined by an acrobatic dancer, the performers will be lifted more than 100 feet into the sky on a giant telescopic crane. Get your man-bun ready, it's time for 'cool' irregular bingo again! The 2017 Galway Garden Festival - 1st and 2nd July at Claregalway Castle with, Music, Street Theatre, Food, Craft and a Medieval Tournament.